Tre Stagione Getaway! Cottage Style Molto casa privata. Summer Getaway! Molto privato (si attesta terra di conservazione), pulito e ordinato 2 camere da letto a casa solo 1 miglio dal suono Nantucket. 2 camere da letto, 1 Casa-bagno tutto l'anno in stile cottage con quattro posti letto. Lavanderia, cucina abitabile, Aria condizionata, doccia esterna. Estrarre divano in salotto. TV via cavo, DVD, stereo. Nuova pavimentazione in laminato e letti per il 2010. Grande doccia esterna privata chiusa anche. Aria condizionata, TV, VCR, DVD e via cavo (TV via cavo in camera da letto principale anche), Stereo, lavanderia, cucina abitabile, doccia esterna, Charcoal Grill. The cottage was in the rear of an attractive home of a main road in Harwich. The property is on the smaller side but great for a couple or couple with a small child. The owners were most accommodating (we failed to bring our own beddings), and the location was super between Chatham and main street in Harwich. The cottage had many amenities. We would stay again! So glad you were pleased and enjoyed your stay Fred. Come again any time! My girlfriend and I just stayed for 4 days at this wonderful, classic Cape Cod cottage and it far exceeded our expectations. I've been going to the Harwich/Chatham area on vacation for about 15 times dating back to the 80's and this cottage was one of the best I've ever stayed at. It's perfect for up to 4 people. It's not really walking distance to the beach (we did walk to the beach but with gear it would be tough) but I didn't expect it to be. Instead, it offered the most privacy of any place I've ever been. It's behind a main house and is completely private on all 4 sides. Inside, it was completely clean and everything worked. The couch was super comfortable. TV's in the living room and master bedroom. The bathroom was really clean and had additional supplies. The kitchen had everything one would need. I cooked a full clambake with a 2.75 lb lobster and they had a pot to fit it all. As well as cleaning supplies to clean up afterward. There is a washer/dryer as well and both worked perfectly. Outside, the sitting area is so nice. There are 2 couches with an umbrella, a 4 seat table also with an umbrella and 2 more separate sitting chairs with side tables. The pictures don't do it justice especially with all the greenery surrounding you. There's a spacious outside shower and if both showers are running, inside and out, the water temp does not get messed up. In addition, they have a planter with numerous herbs and even grape tomatoes growing. I used the Weber grill with charcoal found in the supply closet, to cook some amazing local swordfish with the rosemary found in that planter. We even used a bit of mint for a few cocktails. Also to note, the lawn area is large. Perfect for kids to play. A previous reviewer complained about a number of things. Bird droppings outside, well, there are so many trees surrounding the property that I wasn't surprised to see some on the top of an umbrella. But there was nothing on the numerous couches or chairs and we enjoyed spending time every evening outside. The couch inside was completely clean, I have no idea where that complaint came from. Also, the only cobweb I saw was a small one in one corner outside the house. Please, you're in nature. There was no smell of gas using the dryer. We used it multiple times. As to checking under the beds/furniture, I have better things to do on vacation. The owners, Andy and Enid, were very responsive with any questions and we look forward to visiting again. Jim thanks so much for the wonderful review! Really glad you appreciated all our efforts to make the cottage as special as it is. Appreciate you taking the time to set the record straight! We'd love to have you back anytime of course. The cottage was cute but not maintained. It was perfect for my husband, son and I. However, upon arrival it was evident that no one had cleaned in quite a while. The walls and woodwork were dirty, cobwebs were in every room with bugs or dust stuck in them. All the window sills were dirty and covered in tiny dead bugs. I cleaned all surfaces including the black "gunk" that had accumulated around the faucets. The couch had enough stains that we purchased a set of sheets to cover it so we could sit comfortably. There was dust, debris under the beds and furniture. The outdoor sitting area was very nice, however we couldn't use it because it was covered in bird droppings. We didn't spend much time in or at the cottage. Too bad, because decor was really cute. The other reviews that bragged about the property were very deceiving. We contacted the owner the first night about the cleanliness or lack of and her response was that she was sorry the cleanliness didn't meet our expectations, hope we enjoy our stay. In other words, she wasn't going to do anything about it. When you used the dryer, the smell of gas was so strong you had to open the windows. Needless to say we were very disappointed in the state of the cottage when we arrived and even more disappointed by the owners lack of interest in our concerns. Sorry it didn't work out for you. We don't feel the need to respond to your complaints about the cleanliness of our cottage. We prefer to stand on our reputation and the now 17 years of positive feedback from our guests. The property had everything we needed for a fun stay on the Cape. From the private yard to the outdoor shower and grill. We wanted for nothing in the kitchen and slept peacefully every night. I would certainly stay again next year. 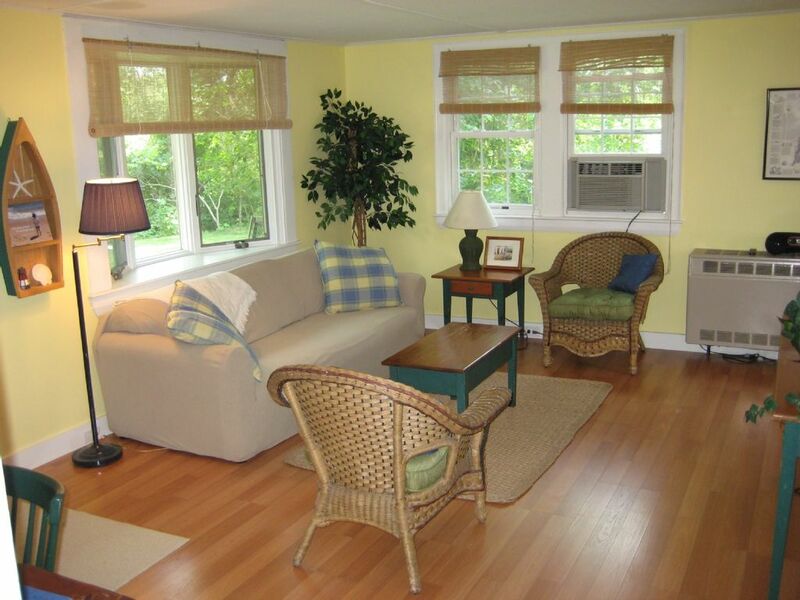 This cute place was conveniently located close to Red River Beach and just a few miles from Harwich Port center. It was clean, comfy and had everything we needed for a great week on the Cape. We loved this property from the minute we drove up the long driveway. The cottage was clean, cheery and with fresh flowers on the table! Of course, I failed to read the fine print about bringing our own sheets, but the owner was more than happy to give us a basket of sheets and let us make the beds. We were on the Cape for a wedding that, despite the rain and fog, was deeeeligtful. All great! 1/4 miglio dalla pista ciclabile. 1 miglio da splendide spiagge di Nantucket Sound. Sia centro di Chatham e Harwichport sono solo a breve distanza da questa proprietà situato in posizione centrale. È il nome l'attività ed è vicino; film, spiaggia, go-kart, trampolini, barche paraurti, National Seashore, Nantucket e Martha Vineyard Ferries, stagni di acqua dolce e l'elenco potrebbe continuare!